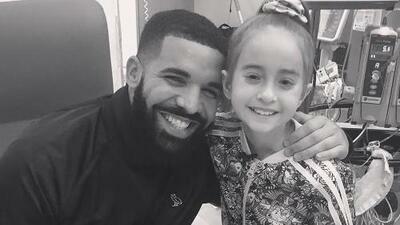 Drake took time out of his busy schedule to visit 11-year-old Sophia Sanchez at Lurie Children's Hospital in Chicago on Monday, August 20th. Sanchez had posted a video of herself doing the "In My Feelings" challenge that was shared on social media. Little did Sanchez know that Drake saw the viral video. Drake had posted a photo of him with Sanchez saying: "Me and my love Sofia talking about Bieber and Owls and Basketball." Drake even gifted Sanchez a black "Scorpion" hat that she wore proudly.